Scripture: Who art thou, O great mountain? before Zerubbabel thou shalt become a plain: and he shall bring forth the headstone thereof with shoutings, crying, Grace, grace unto it. Zechariah 4:7. Thought For The Day: Mountains are movable and surmountable. One of the greatest obstacles of destiny before a child of God is a mountain. Physically, a person cannot move forward in life when confronted with a mountain. When a person is confronted with a spiritual mountain, his destiny is stagnated. Mountains limit destinies. Mountains are age-long strongholds; they are strongholds that have lasted for a very long time around a person. In the physical, we see mountains as established strongholds that have been in place for generations. In all probability, they may have existed for many generations before being noticed or its effects felt. In the spiritual, mountains can be likened to generational spells, curses, issues and setbacks that have lasted for generations. You may be facing ancestral or generational spells and curses which have limited your destiny; you may be struggling in life, trying all you can to succeed, yet have no result to show for it. This is a typical manifestation of the mountain. Beloved, the good news is, there is a mountain-moving God. Mountains are movable and surmountable by the power of God. Therefore, connect with God who has the power to move any mountain of life. Remember this: Mountains are movable and surmountable. 1. Identify any spiritual mountain in your life. 2. Connect with the mountain-moving Power of God. Prayer: O LORD, break every limiting yoke, curse and spell that has stagnated my life and destiny in Jesus’ Name. FOR FURTHER UNDERSTANDING, GET THIS MESSAGE: MOUNTAIN-MOVING FAITH. Amazing Fact: The average person has 10,000 taste buds, with 2,000 of those under the tongue, inside the cheeks, and on the roof of the mouth. Today In History: 1/6/1980 – Cable News Network (CNN) began broadcasting. Quote: There is no success without secrets; there is no possibility without responsibility. Culled from 30 SECRETS TO THE TOP by Dr Paul Enenche. 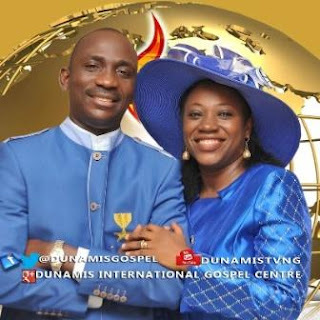 Dunamis International Gospel Centre (DIGC), is a powerfully anointed church, headquartered at Abuja, Nigeria, with Dr Paul and Dr Becky Enenche, as the Senior Pastors. It is a power-packed arena where God’s Presence, Principles and Power are at work for the salvation, healing and restoration of human destinies and dignities.